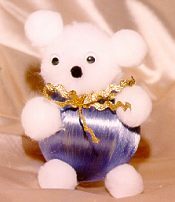 Glue the two inch pom pom on top of the Christmas ornament, just in front of the hanger. This will form the head. Glue two 1/4" pom poms to the top of the head to form ears. Glue one 1/4" pom pom to the center of the face to form a nose. Glue the two eyes in place above the nose. Cut a smile out of the scrap of red felt and glue to the face underneath the nose. Glue the four 1/2" pom poms to the ornament to form four legs. You can use 3 dimensional paint to write a child's name on the bear's tummy.